What a little “dandy”. I’m really pleased with the outcome of Bookish Bunny. Nattily attired in his reading jacket, with vest, he appears to have a bit of a Lewis Carroll influence. He joins the growing display of “Mike’s Musings” in our home. An old friend, Ron Denis asked if I could use the jacket cover from his new children’s book “Adventures in Shroomville”. Unfortunately Ron, due to the limited space on the face of the book it was impossible to justice to the cover art. If another project comes up with a book in it .. I promise I’ll try and work the cover art into it. By the by, Ron is having a book signing Sunday, April 17, 2011 at 1:00pm at Chapters, 1950 The Queensway, Etobicoke. Bookish Bunny will be named after Tim Srigley’s boyhood rabbit (better remind of that name Tim so I can add it to the title). Tim is one of my former workmates from JAN Kelley Marketing and remains a good friend. 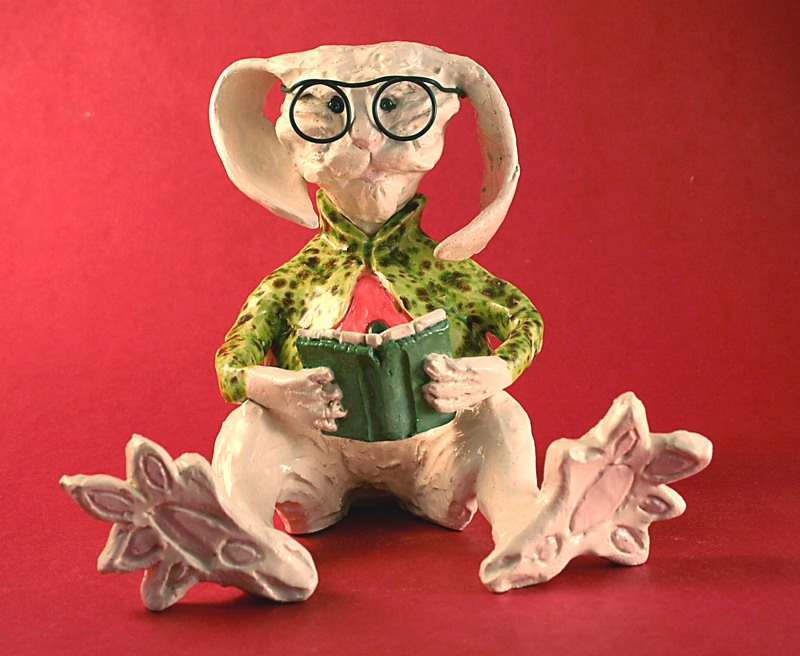 Bookish Bunny would have a retail value of $125 … and that takes into account cost of materials, kiln costs and below minimum wage for the artist. Unfortunately a typical return for many artists. The real joy is in seeing an idea come to life and, in the final stages, being satisfied with the results. Handbuilding and sculpting in clay gives me a great deal of enjoyment and at the end of each piece my mind starts working on the next project. Today’s project – tax preparation. Oh, joy. When I get frustrated with that I’ll think I’ll reward myself with a little studio time. I have a very stylized bird that is waiting for a perch. Mike, this is a very adorable bunny. Did YOU make it? I didn’t know you were making creatures! How about Piston Barnswallow? Have you made a sculpture of him yet? Previous Previous post: Variability of Communities. No Tim Horton’s here.